I am having the same issue as the other forum members. When I try to boot up and create a master deploy image on my Dell Latitude E6540, I have no NIC drivers for the laptop making it un-usable for our imaging purposes. Can I please get the information you provided for the other members too? I am experiencing the same issues with Snap Deploy 4.0.540 when deploying or trying to create an image on a Dell Latitude E7440. Could I get a link to the new build as well? My client has HP EliteDesk 800 G1. Acronis SnapDeploy4 Bootable CD does not detect the network card. Please send me the link to the download as well. If you have a valid support contract, reach out to the web based chat and they will provide a FTP link to this patch, otherwise you'll probably need to wait until you get the PM. The build 540 not support a network-card lntel 218-LM? I have the same problem with my HP EliteBook 850 G1. We're having the same issue with build 540 not recognizing the Intel I218-LM network adapter. I logged into our account to download build 582 but 540 is the only build available on your website. Can you please send me a link for the latest build? if you experience an issue with NIC recognition and need the latest build (584), please send me your request in a PM. Having the same issue, sent you a PM Anna. Thanks. I sent her a message yesterday, but did not get a reply. So I also opened a support case. I keep asking and not getting any answer as to why this is not posted under the "latest" updates on the website. Why do I have to jump through so many hoops to get a fix for broken software.. Not a happy camper that this has not put my deployment project behind a full day. I expect when your software doesn't work and you have a fix that you are quick to deploy it or get it to users who have the issue. I've sent you PMs with link. I sent you a PM. I'd like the latest build when you get a chance. Thank you. My name is Jim Kerr and I work at the Help Desk for the Victims Compensation and Government Claims Board (VCGCB). We just received a shipment of HP EliteDesk 800 computers with this same issue - the NIC is not recognized by Snap Deploy 4. Would it be possible to acquire an updated version that has the drivers for our new NIC? Also, do you provide any utility that will enable me to add drivers myself? I'm having this same issue with Dell latitude 3340. Please can you send me too the link to the updated build? download links has been sent. I'm having problems with a HP DL360p Gen8 and a HP DL380e Gen 8, please can you send the link so that I can see if it helps? I've sent you a private message with the download link. Hello, I also need build 582 to be able to deploy to my new HP Revolve 810 G2 laptops. The old 540 build worked with the HP Revole 810 G1 laptops but not with G2. I am having the same problem with an HP desktop system .. can you send me a link to the update? Thank you! I am having the same issue as to where the I217-LM NIC on our Prodesk 600 G1's are not being recognized. We are using Snap Deploy 3.5. If Acronis happens to have a fix or patch for the issue, please let me know. I've sent you links to a newer build. Could you please add me to the list so I can download the latest build which supports the newer network cards? I am having exactly the same problem with a new HP EliteDesk 800 G1 and have never had a problem detecting the network card until this model. We want to test Snap Deploy but no network cards are detected. We have the problem with HP zBook 15 with Intel I217-LM, can you help us? I've sent you download links. Can you give me this update too please? We would like the link to the updated build as well. We are having the same issue described above. When is Acronis going to post a general new/updated release for Snap Deploy that will address the problems we are all having? The fact that so many people are having difficulty using the current generally available release with MAJOR brands of hardware should make you all think about taking action! Can you please provide an update to all of us on this thread what is being worked on? We are also experiencing this issue on T440p laptops. It would be great to try out the latest build. Same problem here, please send the link to the latest build. I understand there is a newer build than .540 available but it is not shown under my Subscription products downloads. Can you please provide me the latest build (probably 582) as I do not have NIC access on my new Dell mobile workstations. I'm having the same problem with NIC drivers on a dell latitude 2120. Can you send me a link to the new build please? i have the same issue here with our zBooks. Can i have the link too please? I have the same issue with HP DeskElite 800 G1. It's possible to have the link ? Same issue. We have 50 new Dell Latitude 3340's to image that the NIC driver is not working with current build. According to what I know, a new release is to be published quite soon. I would recommend you to try it, once it is out. Thank you for the information. I will use the new release when it arrives, but being with a school district, I have machines arriving daily that need to be imaged and set out. Waiting on a future release doesn't really help me today. I am having a problem imaging new Dell5440 laptops; Acronis launches from the server and I am getting a network failed to initialize after the first Acronis page (see attached screenshot). Please advise. Yes I received the message and the issue resolved- thanks for your help. A few months ago I was having this same issue, and posted in this very thread. We got the 582 build and everything worked fine, however we recently got new systems with ASUS Z97 chipset boards, and we are having the exact same issue again. We are currently running 582, and once again Acronis cant find any network adapters to connect to. We are now back to square one on this issue. We have just starting a trial of Snap Deploy at our school to see if it would be of use in deploying an image across to some new laptops. 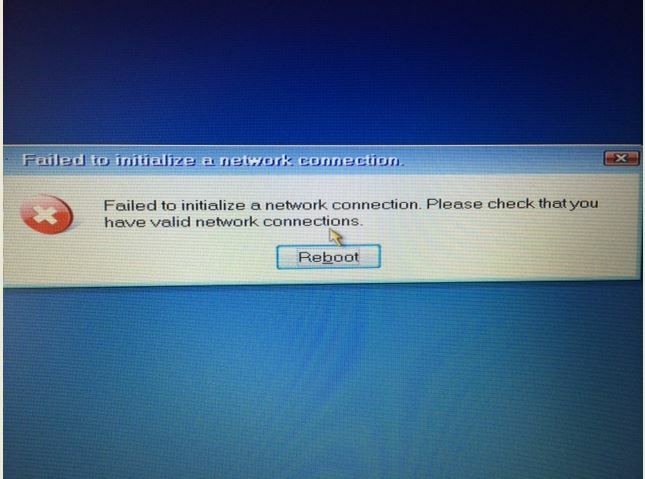 They are a Toshiba Satellite Pro model however the network adapter is not being detected. Would be possible to obtain the latest build (582) to see if this would solve the issue before we go ahead with a purchase ? I've sent PMs to everybody who requested it. can i get the link ? I could use an update as well, could I get a link?